I wanted to incorporate some of the old traditional forms of embroidery from Norway into something fun and quirky. 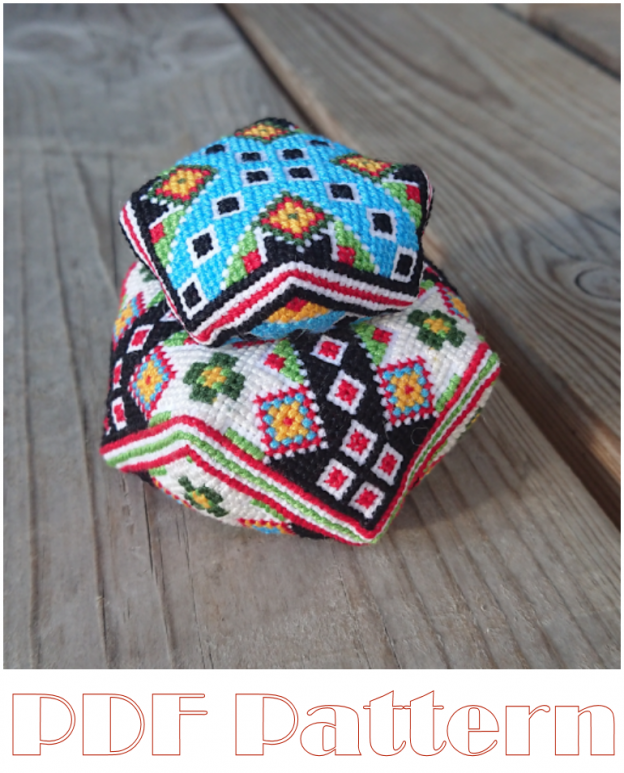 In my humble opinion, biscornu pincushions are loads of fun and quirkness! So I dug out some old photos of what is called “breastcloth” that is worn with a specific type of folk costume that are usually covered in some kind of bead embroidery and started to reconstruct it piece by piece in order to make a pincushion from it. The large piece contains all the original colours, which looks amazing. Clearly, I don’t use black often enough in my work. The smaller piece has the original colours, but shifted around in an attempt to give it a more fun / modern look with less black and more bright colours. The patterns are for sale in my shop here complete with photos and DMC codes. The small one later became a keychain decoration for my husband. He thinks it’s the cutest thing he’s ever seen. This entry was posted in Shop and tagged norwegian, shop on 3. July 2018 by Elise.